Contrary to Internet rumors, eating pineapple isn't going to magically dissolve your body fat. Adding more vegetables and fruits, such as pineapple, to your diet, however, does tend to increase your weight loss results slightly, according to a study published in "The American Journal of Clinical Nutrition" in May 2009. The relatively low calorie content and energy density of pineapple may help fill you up while still staying within your recommended daily calorie goals for weight loss. If you want a sweet treat, a fruit like pineapple is a good choice because it provides fiber, vitamins and minerals along with the sweet taste you're craving. A cup of raw pineapple has 83 calories. If you buy canned pineapple, choose one packed in water or pineapple juice, not heavy syrup. The syrup adds a lot of extra calories, which you don't want if you're trying to lose weight. A cup of water-packed canned pineapple has 79 calories, but the type packed in heavy syrup has more than twice as many calories with 198 per cup. Foods that are low in energy density, or calories per gram, help with weight loss because they help you feel full without eating too many calories. It is the volume of food you eat that helps you feel full, not the number of calories. Pineapple is very low in energy density, with a score of 0.5. 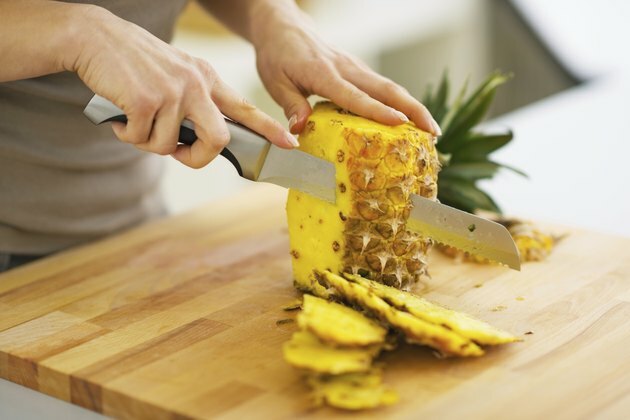 Mixing low-energy-density foods, like pineapple, with foods higher in energy density can help you lower the overall energy density of your meals. Add pineapple to low-fat yogurt or cottage cheese for a snack, top meat or fish with pineapple salsa for dinner or have a fruit salad for dessert. Pineapple contains an enzyme called bromelain. Although bromelain can break down tissues in meat, which may cause some people to think it could do the same to body fat, studies as of April 2014 haven't shown any weight loss benefits for this enzyme, according to the American Cancer Society. Bromelain supplements may also interact with certain medications and can cause allergic reactions in susceptible people, so they may not be safe for everyone. To lose weight, you need to eat fewer calories than you use during the day. This means being more active and replacing other, less healthy foods with pineapple rather than adding pineapple to whatever you're already eating. You'll also need to watch your portion sizes, because the calories from any food, including pineapple, can quickly add up if you eat too much of it.